Worker loses hundreds of dollars in workers comp benefits every week. An Injured Worker Hurt in DC is losing hundreds of dollars every week - Don't Let this Happen to You. Imagine your frustration. You are a high wage earner, earning over $2,000 per week, in salary, overtime, and bonuses. But an on the job injury means you can't work. You were hurt in D.C. but you live in Maryland and your company is in Maryland. So, you try to do the right thing. You listen to the insurance company and you sign the paperwork and forms they send you so they can file the forms with "workers comp" and get your benefits going and your medical treatment paid for. They send you Maryland workers comp claim forms, which kind of makes sense, doesn't it? After all, every state has workers comp benefits. You see, insurance adjusters have handled hundreds or many times thousands of workers comp cases. And they know the differences in the benefit rates between D.C., Maryland and Virginia. The maximum comp rate in D.C. is several hundred dollars higher than the max rate in Maryland or Virginia. And at your income level, you're at the max rate. So if your case should be in D.C. but there is any connection to Maryland or Virginia, where will the insurance company file those claim forms for you? (Hint: it won't be in a place where they have to pay you more). So don't let them do it. If you're smart enough to make that kind of money, be smart enough to read the only book on D.C. workers compensation written by a nationally Board Certified practicing attorney - order your free, no obligation copy of Protect Your Rights: The Ultimate Guide to D.C. Workers Compensation today. Not sure what to do and can't wait for the book to answer your questions? Call us today at (202) 393 - 3320. We can help. 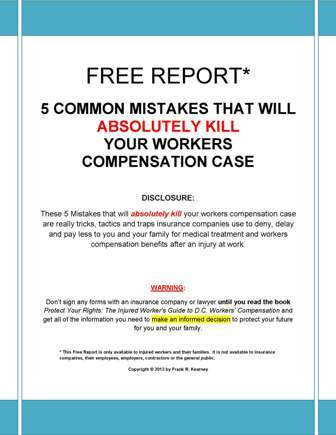 Don't make the 5 mistakes that will ABSOLUTELY KILL your workers compensation case! Click here to download your free report so you don't make these common mistakes that too many injured workers make. Remember, the insurance adjuster has years of training and experience. They also have a team of lawyers, investigators, nurse case-managers, doctors, and more to use against you to limit your benefits and medical treatment. Don't let them take advantage of you and your family. Don't wait. What you do at the beginning of your claim can be critical to getting the medical treatment and benefits you may need later on.